NEW DELHI, MARCH 29: Jawahar Navodaya Vidyalaya has published the result of Jawahar Navodaya Vidyalaya Selection Test (JNVST 2019) for class 9 entrance exam on its official website. JNVST result is released for the exam conducted on February 2, 2019. 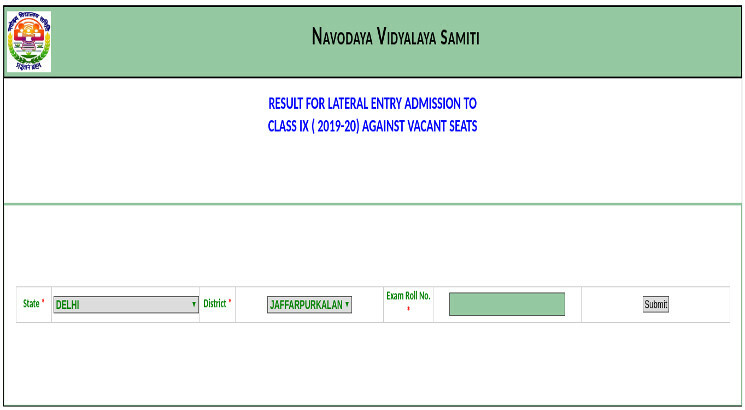 JNV result 2019 for class 9 can be checked in online and offline. Choose the state and district of a candidate. Enter canididate’s roll number in appropriate field. Take a printout of the result and keep it safe for future reference. The Navodaya result will also available on the notice board of respective Vidyalaya as well as published on the website of JNVs concerned. Selected candidates will also be informed by Speed post and SMS. The parents of the selected candidates will have the need to fill and submit admission form to their respective Vidyalaya along with required documents. After document verification, JNVs will confirm the admission, if the candidate is found eligible as per NVS norms.